This [dead] zone continues to threaten living resources including humans that depend on fish, shrimp and crabs. 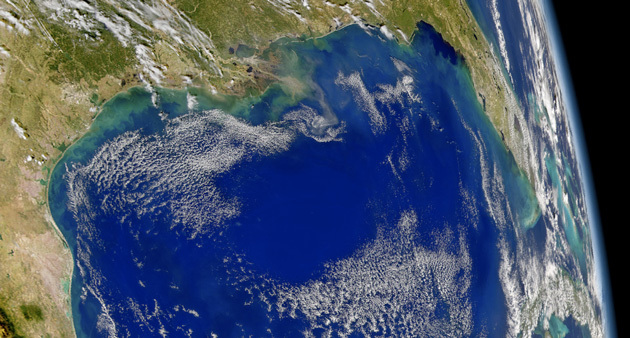 Excess nutrients, particularly nitrogen and phosphorus, cause huge algae blooms whose decomposition leads to oxygen distress and even organism death in the Gulf’s richest waters. I thought it might be interesting to take a look at the full lineage of this unfolding disaster—starting with the polar jet stream. 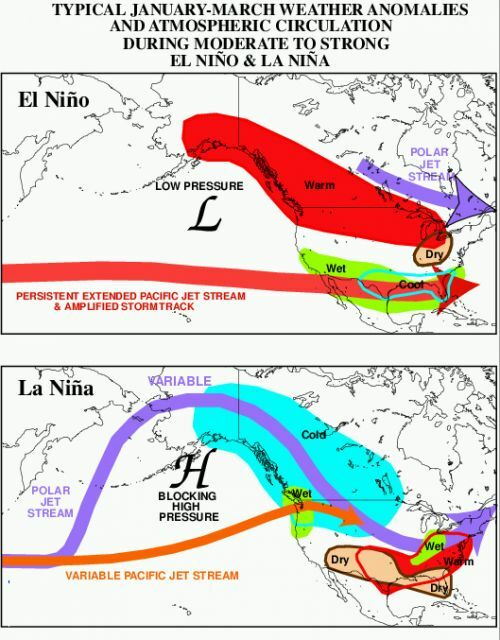 La Niña alters the path of the jet stream, making the predominant storm track in winter traverse the Midwest and avoid the South… La Niña’s influence on the jet stream and U.S. weather typically fades in springtime… However, in 2011, the La Niña influence on U.S. weather stayed strong throughout spring… with wind speeds more typical of winter than spring… A series of strong storms moved along the jet stream and pulled up warm, moist Gulf of Mexico air, which mixed with the cold air spilling south from Canada. 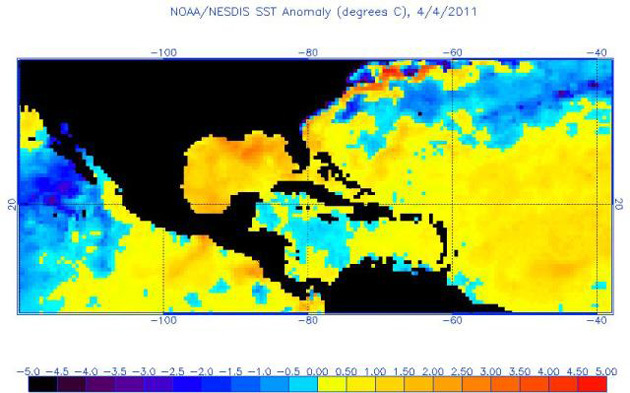 Sea surface temperatures (SSTs) in the Gulf of Mexico warmed to 1°C (1.8°F) above average during April—the third warmest temperatures in over a century of record keeping… These unusually warm surface waters allowed much more moisture than usual to evaporate into the air, resulting in unprecedented rains over the Midwest when the warm, moist air swirled into the unusually cold air spilling southwards from Canada. With the jet stream at exceptional winter-like strengths, the stage was also set for massive tornado outbreaks. 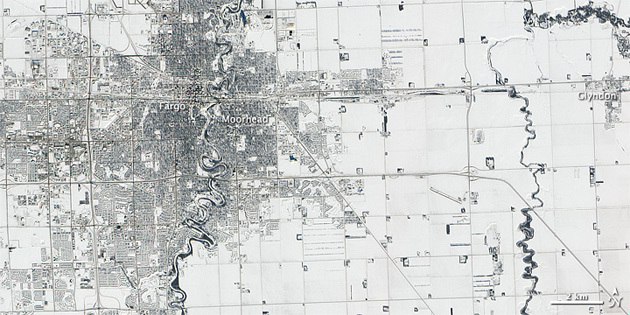 Above: North Dakota, 12 Dec 2010. Below: swollen lower Mississippi River, 1 June 2011. 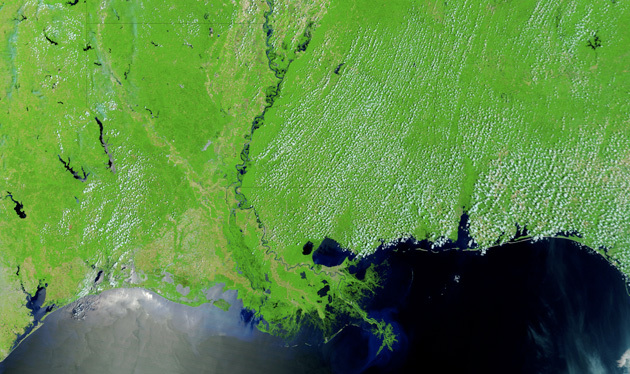 NASAIn the two images above, taken six months apart, you can see how winter’s heavy snows, pounded by spring’s heavy snowmelts and ongoing heavy rains, changed the Mississippi landscape… and—ultimately—the seascape. 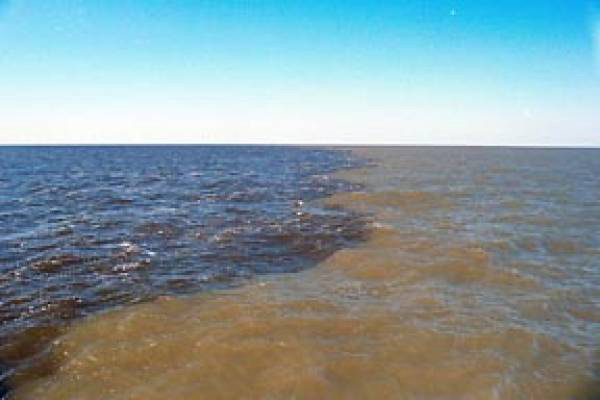 Mississippi River sediment in the Gulf of Mexico. NASAThe problem—as I wrote earlier—is all the stuff in the floodwaters that isn’t riverwater, namely fertilizers and other enrichers, like manure, which are the drivers behind the dead zone. One thing we can say is that since global ocean temperatures have warmed about 0.6°C (1°F) over the past 40 years, there is more moisture in the air to generate record flooding rains. 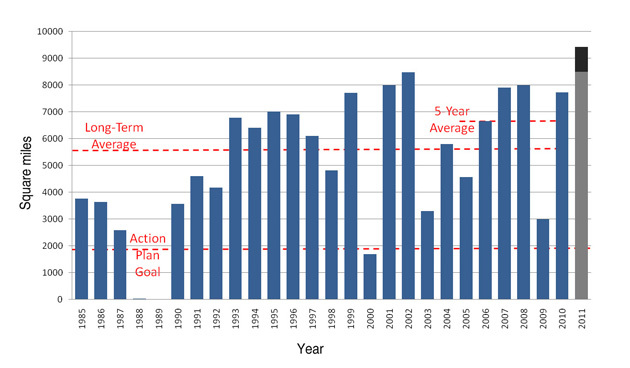 The near-record warm Gulf of Mexico SSTs this April that led to record Ohio Valley rainfalls and the 100-year $5 billion+ flood on the Mississippi River would have been much harder to realize without global warming. The growing dead zone would be slower to realize without global warming too… Another entanglement in the double helix connecting land to air to sea. Jerome Walker, Dennis Myts/Wikimedia Commons.